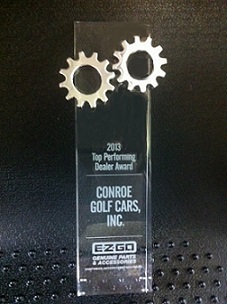 Trust the company that is the largest Club Car and E-Z-GO dealer in the country with your parts and accessories needs! We've got 39+ years of serving in the "real world"! Our factory trained technicians have tested and installed the parts featured on the site. They work for us, and we know they will work for you. We enjoy making something extraordinary out of the ordinary. Our goal is to help you do the same. If you can't find the part you are looking for on our website that doesn't mean we do not have it. award for the top performing dealer for parts and accessories in 2013.